Z: A Novel of Zelda Fitzgerald – What are you reading? Eliot’s quote is one that accurately reflects the Fitzgeralds’ crazy life. They were in over their heads from the start, even when things appeared to be going swimmingly. But in Therese Anne Fowler’s fictionalized novel about the “Golden Couple,” Zelda Sayre Fitzgerald’s dutiful, and often frustrated, voice comes through loud and clear, telling their story from her point of view. Z begins with the fall of Scott and Zelda’s meteoric rise to fame and infamy. Zelda, back in her hometown of Montgomery, Alabama after six years of various sanatorium stays, is hurriedly writing a reply to Scott’s letter, who himself is making a go of it in Hollywood. Both are older, in not-so-great health, but still have a bit of the hope that brought them together twenty years earlier. As they try to begin anew and piece together the remnants of their once glamorous life, Zelda invites readers to see that she and her husband were not at all what they seemed. Z: A Novel of Zelda Fitzgerald is exactly that. The novel is told through Zelda’s eyes and words, beginning with a first look at the very rebellious seventeen-year old ballerina who does what she wants, until she meets the young Lt. Fitzgerald. The two are smitten almost instantly and nothing, not even themselves, could tear them apart. The Fitzgeralds marry in New York City against family warnings, and things move at the speed of light from then on. Scott publishes his first novel, This Side of Paradise, making him a fast celebrity and opening doors to people and places once thought beyond the couple’s reach. Invitations to parties, dinners and the occasional speakeasy become the norm, which makes Scott more than happy. He positively glows under the adulation and constant attention and his wife is more than happy for her husband. Unfortunately, that attention is where the troubles begin. As Scott tries to hold on to his fame while living the life he desperately wants, Zelda stands by her man, losing herself one day at a time. Fowler’s take on the Fitzgeralds is an ambitious one, particularly since so much is still unknown about them. The author, however, used a clear sense of frustration and urgency in the novel, creating those same feelings in the reader. The Fitzgeralds were moving at full speed from the day they met, which is reflected in the way Fowler described the events, people and places that shaped their lives. The author did a fantastic job of also creating the feeling of claustrophobia Zelda felt when her desire to be something other than F. Scott Fitzgerald’s wife seemed to be dampened at every turn. As someone who tends to go through the motions when reading a good book, I found myself easily engrossed in Fowler’s novel. I especially enjoyed all of the details the author brought to the Fitzgeralds’ story. A great example of this is when Zelda first arrived in New York City, taking in the spectacle that was the old Pennsylvania Station. “Passengers streamed around and past us. I was transfixed by the steel trusses that went up and up and up to wide glass panels and the blue, blue sky beyond.” As a New Yorker used to the monstrosity that is now Pennsylvania Station, it was easy to imagine myself as a newbie to the big city, staring at one of the many wonders Manhattan had to offer. One of the great mysteries of the Fitzgeralds is the relationship between Zelda and Ernest Hemingway. There has been much speculation as to why those two detested each other. In Z, Fowler created her own reason for the discord, which is definitely a plausible one. She also explored the relationship between Scott and Hemingway, and how it affected Zelda personally, as well as her marriage. 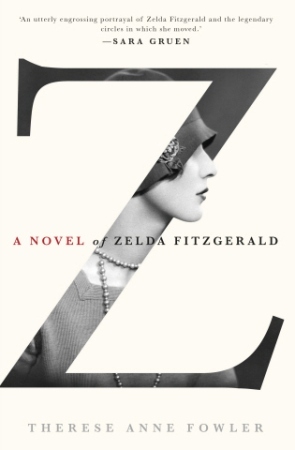 Z: A Novel of Zelda Fitzgerald is a great read thanks to Fowler’s fast-paced writing style. It’s a pretty easy read but will keep you entertained from beginning to end. I definitely recommend it. Loved this book from beginning to end. I would also recommend The Paris wife. Hi there! I read The Paris Wife and I loved it, as well. Thanks for your comment!